This 1936 540K chassis, with Sindelfinger Karosserie coachwork, appeared first on the Mercedes-Benz display stand at the Berlin Motor Show in February 1937. It was love at first sight for Jack Warner; subsequently Warner Brothers Studios purchased this Special Roadster for his personal use. After returning to the factory in preparation for US delivery, which included the installation of a MPH speedometer and a "Made in Germany" identification plate, it was shipped to New York City. Mitropa Motors showcased this magnificent car in their print advertisements. Jack Warner kept the car for over ten years. Dr. Sam Scher owned the car briefly before Connecticut veterinarian George Bitgood purchased it in 1949. The car was used very little by Dr. Bitgood before he put it away with the rest of his 540K collection. This elegant roadster stayed in his dirt-floored garage undisturbed for thirty-five years. When we located this car for our client we were most excited by its originality. After more than five decades of use, the odometer on it read less than 11,000 miles. It had never been apart, and so we were able to investigate and authentically reproduce the details and craftsmanship as created by the factory over sixty years ago. One of the points of originality, which may be hard to appreciate amongst all the other details, is the upholstery material. We choose each vegetable-tanned top-grain leather hide individually, looking for the tannage and grain authentic to the period. The hides are surface dyed to match the original supplier's technique and color. Of the twenty-six long-tail Special Roadsters built, this is one of only six bodied with the spare tire well fully covered. Over the years the spare tire cover had been misplaced and a new one needed to be fabricated, which entailed first making a wooden pattern and then a brass casting to replicate its graceful chrome plated brass handle. Undoubtedly the car is elegant and stylish, yet what many find surprising is its drivability. To the uninformed, all cars from the pre-war era are thought to drive like trucks. In fact, Mercedes-Benz engineering was far ahead of its time. When these cars have had each component brought back to its original mechanical standards, as we have done here, you can experience Grand Touring at its best. 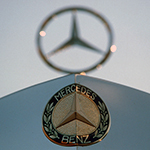 In its debut at Pebble Beach in 1995, this car was awarded First in Class and the Mercedes-Benz Trophy. Two years later it was still winning, earning its third Best of Show at the 1997 Amelia Island Concours. Sixteen years later this aristocratic Special Roadster returned to our shop for a "spa treatment" prior to the 2011 Pebble Beach Concours d'Elegance, where it was judged to be the Most Elegant Convertible and, again, First in Class.